This is The Digital Story Podcast #583, May 9, 2017. Today's theme is "What Separates You from the Other Guy" I'm Derrick Story. There are millions of smartphone cameras out there clicking billions of photos every year. Styles range from snaps of a sweetheart to attempts at fine art. Now, more than ever before, everyone is a photographer. Which is great, that is, unless photography is your craft. And if it is, how do you distinguish your work from those who don't know the difference between an f-stop and a bus stop. Thoughts about this, and more, on today TDS podcast. My friend Oliver is staying at the studio during his visit here from Germany. When he first arrived, I was showing him around the place, and he noticed the film cameras I had out for testing. "You're shooting film," he asked. "Yes I am," I answered. "For both fun and business." "Why wouldn't people just buy something dirt cheap on eBay rather than paying a bit more from you?" "It's all about quality and consistency," I replied. "When you buy on eBay, you really don't know what you're going to receive. Believe me, I know firsthand. But when you make a purchase from TheFilmCameraShop, you know that you're going to get a clean, properly functioning camera that is packed nicely and arrives on time. And judging by the popularity of the store, those qualities are important to a lot of people." This is the same approach that I apply to working with clients, and to making pictures. And if you're interested in distinguishing your work from others, you might want to think about these five suggestions. Practice using the best light possible - I still can't believe what a big difference a few steps make. I'm also looking for the best angle of light, and by looking at my series of photos, it makes a big difference. And remember, if a different angle makes a minor improvement to your eyes, it will be even more so for the camera. Compose with great care - Pay attention to distracting background elements, look at all four corners of the frame, and think about the highlight and shadow areas. Post production is important - Whether it's taking advantage of the filters and adjustments in Instagram or the advanced controls in Lightroom and Luminar, post production matters. Presentation elevates - I've taken my Instagram shots, printed and framed them, then marveled how absolutely different they look. Take pride in your work - Pride won't serve you well in relationships, but it's very useful when it comes to producing beautiful images. I've been getting to know a Sekonic Speedmaster L-858D-U handheld light meter. I'll start digging into the particulars of this device in next week's show. But before I do that, I thought we should cover why someone would want to use a handheld meter in the first place. Not limited to reflected light readings. The meters in our cameras are quite good. But they only can measure reflected light, which can be influenced by color, and often needs to be compensated for. Incident light readings measure directly from the source. In this case, you point the meter directly at the light source and measure. So colors, highlights, and dark areas don't influence the measurement. Can measure flash output. Again, our cameras have TTL flash metering, and again it can be easily fooled. Whereas a separate handheld meter can read the light from the flash itself. Handheld meters can help you balance ambient light and flash output in ways that you never dreamed before. And once you find the magic formula for your work, you can repeat it time and time again because you working with actual light measurements. At first you may thing that handheld light meters would be used primarily for commercial work. And it's true, they are used there. But when you really want to get creative and balance various light sources for a truly creative effect, they are indispensable. We'll dig deeper into this subject next week. If you want to learn more about the Sekonic Speedmaster L-858D-U handheld light meter, visit the link in these show notes. Imaging-Resource.com reports: "Olympus has announced significant firmware updates that enhance the performance and capability of the OM-D E-M1 Mark II, the OM-D E-M5 Mark II, the PEN-F and select Zuiko Pro and Premium lenses. These updates are available immediately, and for the OM-D series cameras includes true compatibility with the Profoto Air Remote TTL-O, a new "Save Settings and Mysets" which preserves camera settings on a computer (currently on the E-M1 Mark II, but now available for the E-M5 II and PEN-F), and a midtone adjustment function which has been added to Highlight & Shadow control. With the update, the PEN-F will offer touch-to-select Art Filters while viewing the effect in real time, and you can set the slowest shutter speed allowed before the camera raises the sensitivity in ISO Auto. For the E-M1 Mark II specifically, High Res Shot and Focus Stacking Modes are now compatible with non-Olympus flashes, and AF HOME settings are saved when the camera is turned off. The E-M5 Mark II is upgraded to Version 3.0, while the PEN-F makes its way to Version 2.0. Sekonic Light Meters - Learn more about the amazing Sekonic Speedmaster L-858D-U handheld light meter by listening to next week's show and visiting the Sekonic web site. This is The Digital Story Podcast #582, May 2, 2017. Today's theme is "5 Unique Trail Tips for Day Hikers" I'm Derrick Story. Spring is in the air, and the allure of the great outdoors calls to our spirit of adventure. What a pleasant thought after a long winter: bubbling mountain springs, picnics beneath a shady tree, and expansive vistas to ponder and photograph. But Mother Nature isn't just flowery meadows and puffy clouds. So a little preparation goes a long ways toward a safe and satisfying adventure. And that's the first story in today's TDS Podcast. I've been strapping on my day pack since I was in grammar school. I completed my first 50 mile hike when I was 11 years old. By the time I was 17, I had earned the rank of Eagle Scout and was spending my summers as a counselor and guide for camp in the Sierras. These days, I hike with my boys and my camera. I'm not as fast up the mountain as I once was, but I still enjoy outdoor life. And a big part of that comes from being prepared and staying nimble. In that spirit, here are five tips that I find myself sharing often with those who I spend time on the trail with. Learn the good plants from the bad ones - In California, we have a lot of Poison Oak and Stinging Nettle. At the beginning of the hike I remind folks that "leaflets three, let it be" to avoid bring home a nasty souvenir from the day's activities. On the other hand, leaves from a Bay tree make a pleasant natural insect repellant, and Miner's Lettuce can serve as a refreshing afternoon snack. A little food and a lot of water - Don't bother packing a lot of food for a day hike. The activity will usually keep your appetite at bay, that is until the hike is over and you're suddenly starving. But you need at least one liter of water, per person. So a couple snack bars or a peanut butter and jelly sandwich and a HydroFlask of H2O should get the job done. No drinking out of streams, ever. Protective clothing works on many fronts - High tech fabrics these days are amazing. You can wear a long sleeved shirt that provides sun protection equal to SPF 50, keeps the bugs off your neck and arms, and provides an additional barrier from plants and rocks. Plus, much of this apparel helps keep you cool in the heat and warm in the shade. Definitely worth revisiting if you haven't shopped outdoor clothing for while. Trail shoes over sneakers - Just like outdoor clothing as improved, so have hiking shoes. I look for soles that provide good traction on rocky surfaces, reasonable ankle support, and protection from blisters and hot spots. Plus, if you have to cross a stream and accidentally step off into the mud, you won't ruin your favorite Nikes. Excess weight is your enemy - When hiking season approaches, I like to lose a few pounds. It's amazing how much easier it is getting up the hills. Plus, I keep my packing weight to a minimum. One camera, two snack bars, water, and the 10 essentials are all I like to carry. Normally, I sell my used gear on Amazon Marketplace. But for some reason, they won't allow me to list my Panasonic gear there. So I'm offering up a great deal on my Lumix GM-5 with 12-32mm Panasonic Zoom in the Nimble Store. This model has the attractive red leather, which is quite handsome against the black satin finish of the camera. Everything is in beautiful shape, and includes all original accessories in the original box. If you're interested, you can purchase the camera in the Nimble Store for $399. If you're interested in registering, visit the Registration Page and sign up! DP Review reports: "Columbia Journalism Review recently surveyed a group of photojournalists on their favorite publications to work with based on several criteria, including arguably the biggest one - pay. As a result, they've published an article revealing the day rates for some top publications as well as some insight into other factors, such as balancing a lower day rate with exposure to a wider audience." "So by the numbers, how do top publications stack up for freelance photographers? CNN comes out on top with the best day rate at $650, though National Geographic is close behind with typical rates between $500-650. Harper's Magazine's rate was hard to pin down but reported rates varied from $500 up to $1000 per day." "The New York Times' recently boosted rate of $450 per day makes it more competitive with the top-paying outlets, but CJR notes that the photographers they spoke with acknowledged the Times' wider reach and top-notch editorial staff go a ways to compensate for the lower pay. Coming in with the lowest day rate of the bunch is the Washington Post, offering $350." This is The Digital Story Podcast #581, April 25, 2017. Today's theme is "Single Frame Story" I'm Derrick Story. When you press the shutter button, what is your goal for that fraction of a second? Are you recording a slice of life? Capturing something beautiful? Not sure really why you took the picture? One exercise that I find useful is trying to tell a complete story within one frame. Everything the viewer needs to know is right there within the boundaries of your viewfinder. And we explore this concept in today's TDS photography podcast. Here are five techniques to help you tell a story within a single frame. Look for Action and Reaction - One person is doing something, and another is reacting to it. In writing we called it man vs man. Variations on this technique is man vs nature, and man vs him or herself. Crop out Extraneous Elements - If the viewers are going to engage with the image, then they need to identify the main activity quickly. Cropping helps you direct the viewer's eye to the main action. Work with Lighting, not Against it - I'm not saying that you have to be so obvious to illuminate the principle character and darken everything else. But you certainly want lighting on your side. Be on the Lookout for Drama and Humor - Dramatic tension, such as the rock climber struggling up a steep incline, or the humor expressed in a facial expression can speak volumes. Look for Dramatic Angles - Capturing the image from a low or high angle can energize the narrative and draw the viewer into the image. Mount the iPhone in the vertical position on the MeFOTO and align it as straight as possible. Enable the Compass App and swipe to the second screen which is the built in level. Square up your iPhone to 0 degrees and test your alignment by panning from left to right. Loosen the panning knob on the MeFOTO so there's just a slight tension. Enable the Camera app and go to Pano mode. Tap the shutter button and pan slowly from left to right. Enjoy your beautifully aligned panorama! Photography, he says, used to be a two part process--Part 1: take pictures; Part 2: develop and print them. With the advent of digital photography, that second part was warped into post-processing and online sharing, but McKinnon believes something was lost in the transition. "Where I love Instagram, and I love digital, and I love where everything's gone," says McKinnon. "It got me thinking: 'People don't print their work enough, and there are SO many benefits that come from printing your stuff out.'" The two benefits McKinnon touches on in this video are (1) Printing helps you understand your photography much better, and (2) Printing your photos lets you 're-discover' that second half of the photographic process. Both of these things help you to improve your own photo taking and, as a bonus, draw more joy out of your photography. This is The Digital Story Podcast #580, April 18, 2017. Today's theme is "The Wedding Civilian" I'm Derrick Story. After years of donning the official uniform of a wedding photographer - Dual DSLRs tugging at my neck, a utility belt pouches crammed full with flashes and lenses, and a creased white shirt pulled three different ways a once - I am now a civilian. I wear a tailored suit without budging pockets, accessorized by a handsome mirrorless camera accenting my tie as it hangs lightly from my neck via its matching leather strap. And not only has my attire changed, but my attitude as well. And that's the topic of today's TDS Photography Podcast. First we must define our terms. A Wedding Civilian is different than Uncle Bob. Now that we've got that squared away, here are five things that a Wedding Civilian should keep in mind. Don't talk to the hired photographer - The last thing that he or she wants to hear about is your camera, your photographic prowess, or your opinion about anything. The official photographer is already dealing with a churning caldron of challenges. Let them be, and stay out of their way. Take advantage of your unique perspective - For the ceremony, choose an angle that allows you to capture the event as a friend or family member. You can record images from the unique perspective of the attendee, surrounded by people, witnessing each moment as it unfolds. I think BTS stories are the most interesting. And you're right there with a backstage pass. Be a silent historian - Turn off your phone, and for the love of Pete, turn off the audible focus confirmation on your camera. Choose the quietest camera you have for the event. And please don't use flash. If you can't capture the shot existing light, wait for another opportunity. Prime lenses are mandatory gear for the Wedding Civilian. Honor the family - You are now an ambassador as well as an artist. In addition to telling the story of the day through your images, honor all requests for portraits and spontaneous group shots. Capture those photos with care, and be sure to share them after the event. Enjoy true photographic freedom - This is what it's all about. You get to sit with friends and family, enjoy the wine, eat when everyone else eats, and take the pictures that you want, when you want to. This is as good as it gets for events. Relish the moment. This week's three-legged adventure with the MeFOTO Roadtrip Air where it accompanied me to a wedding. Yes, it stayed in the car the entire time. So why was I so happy to have it with me. First Nikon, then Panasonic, and now rumors have spread about Pentax. Let me read you a few lines from the article, Relax, Ricoh Isn't Going to Kill the Pentax Brand or Their Cameras (Confirmed), then I have some comments on what we can do as photographers to help these companies. This is The Digital Story Podcast #579, April 11, 2017. Today's theme is "f/2.8 and Be There" I'm Derrick Story. One of the more interesting conversation threads during our SF Street Photography Workshop was about motivation. Our photographers would talk about periods of time where life overtook their art, and during those stretches, the camera seldom saw the light of day. On the flip side, however, it was interesting how quickly they could build momentum once they set aside some time for their camera work. Getting there is half the battle, and how to do that is the topic of today's show. First, you may be wondering why I wrote f/2.8 and Be There instead of the traditional f/8 and Be There. It has to do with mirrorless cameras and diffraction. Now that we've got that squared away, how about that motivation thing? Well, here are a few suggestions. Don't rely too much on your smartphone - Yes, they are convenient, and they do take great pictures. But they also get us out of the habit of making real photography decisions. When possible, carry a traditional camera with you as well - and shoot with it during your daily life moments. Get more exercise outside - Gyms are great for shredding it, but not very good environments for photography, especially if you wish to retain your membership. You need to get outside as well for your workouts (walking, biking, jogging) and take a traditional camera with you. Secure photo time within family time - You don't want photography to drive a wedge in your family life. But you do need to set aside time specifically for your craft. So if you're off on a week long vacation, negotiate before you leave for a few mornings and/or evenings when you can focus on your craft. Spend time with other photographers - The exchange of views and ideas among photographers truly helps keep the creative juices flowing. Workshops, camera clubs, and photo buddies will encourage you to make time for shooting when you might have otherwise settled for another activity. Create projects with deadlines - After everyone in the house has settled down for the night, you can spend some time working on your personal projects. Activities such as organizing, planning, editing, and sharing stimulate the brain. Thinking about your photography before you go to sleep may yield a new idea when you wake up. This week's three-legged adventure with the MeFOTO Roadtrip Air heads to San Francisco where it joined our group for an evening shoot at the Embarcadero. I just published an article titled, 5 Reasons Why the Olympus PEN-F Crushed it in San Francisco, and I thought I'd share those with you now, plus a few additional tidbits. We still have one seat open for our Road Trip workshop. And reservation invitations for the TDS Autumn in Wine Country workshop will go out within the week. If you'd like an invitation to either event, visit the TDS Workshops Page and use the Send Me Info form. This is The Digital Story Podcast #577, March 28, 2017. Today's theme is "What Good is a System that Doesn't Work?" I'm Derrick Story. One of my favorite Jerry Seinfeld routines polks fun at the system failure of car rental agencies. "Anyone can take a reservation," he says. "It's the holding of the reservation that's important." At work and at home we are constantly creating routines and systems to manage our lives. But if put to the test, do they really work? We'll explore in more detail on today's show. What Good is a System that Doesn't Work? In this first segment, I begin by telling a story of an actual event that happened to my mother. Then go on to explain how it illustrates, what I consider, a critical system failure. This week's three-legged adventure with the MeFOTO Roadtrip Air focuses on how its compact size allowed my to carry it all day in my svelte Retrospective 7 while working day and night at the Artisan Cheese Festival in Petaluma, CA. I've been carrying the Think Tank Signature 13, and I have to say, it is as beautiful as it is functional. Inside my Signature 13, I have my 13" MacBook Pro, iPad mini, Pentax KP with 20-40mm zoom, Olympus OM-D E-M5 Mark II, Pentax ZX-5n SLR, extra lenses, and plenty of accessories. The Think Tank Signature 13 sells for $279. This is The Digital Story Podcast #576, March 21, 2017. Today's theme is "If Only One Lens." I'm Derrick Story. Many of us have toyed with the hypothetical question: "If you could take only one lens to a desert island, what would it be?" My view on this has changed over the years, and now there's finally a clear answer... at least for today. And I will reveal my choice in the top story of today's TDS podcast. This week's three-legged adventure with the MeFOTO Roadtrip Air focuses on perching the tripod atop my Audi at Oracle Arena for a spontaneous time lapse recording. Now that I've had a chance to really get to know the latest version of Capture One Pro, here's my list of favorite new features in version 10. I just finished recording a new Capture One Pro Essential Training for version 10, and we should see the release in April from lynda.com. And remember, I have the in-depth Capture One Pro 9 Essential Training available now on lynda.com. More than 5 hours of tips, tricks, and techniques. Plus many free movies using advanced techniques. This is The Digital Story Podcast #575, March 14, 2017. Today's theme is "Existing Light is Alright." I'm Derrick Story. Having departed to Southern California on a minute's notice last week, I grabbed my daily shoulder bag and headed out the door. It contained the gear I carry on a daily basis to the office, nothing more, nothing less. The only flash I had was the popup on the Pentax KP. And as it turned out, I never used it. So capturing life by existing light is the top story for today's show. What are the components and techniques required for effective existing light photography? Here's a look at my list. Prime lenses (or Pro zooms) - Even with great high ISO performance, we still need wide apertures. Effective Auto ISO - For me, existing light photography isn't just setting the ISO to 1600 and shooting everything. I depend a lot on smart Auto ISO that increases sensor sensitivity only as needed, and has a limit at the top end that I can live with. Smart Metering - One of the things that I noticed when testing the Pentax KP was that its evaluative metering was very smart. If there was a window in the frame, it didn't underexpose the rest of the scene as a result. Learning how you camera meters, and adjusting accordingly, is very important. RAW+Jpeg - If I do the first three things right, my Jpegs should be pretty good. But I do want that RAW safety net for situations where I need to recover detail in the shadows or highlights. The Blessed Tripod - Long exposures, HDR, and extended depth of field work better with camera support. Instead of jacking the ISO up to 128,000, You can keep it below a thousand and get tack sharp results with a tripod. This week's three-legged adventure with the MeFOTO Roadtrip Air focuses on a giant family group shot, that was unplanned. As I mentioned at the top of the podcast, I didn't carry a lot of gear on my journey down south. I had my everyday bag and the MeFOTO Roadtrip Air. At my sister's I learned that we were pulling together a family gathering. There were people there that I hadn't seen in years. And after about an hour, I knew we needed a group shot for the history books. And that's when my MeFOTO became invaluable. I brought three cameras on the road trip down south: Olympus OM-D E-M5 Mark II, Pentax ZX-5n SLR, and Pentax KP DSLR. I used all three for various situations, but I'm going to focus on the KP for this segment. Compact for a 24MP DSLR. With the 21mm Pentax prime lens mounted, the KP fits in my workbag along side my mirrorless cameras. Super intelligent features, including choice of DNG or PEF for RAW files. Customizable grips (standard) and buttons. Up and down articulated LCD. Distinctive look that you will either love or hate. As far as nits, I do have a couple. I do think the battery should be a bit bigger and/or last longer. Pentax still uses an old fashioned battery charger that requires a cord. Overall, I really dig this camera and its cool limited edition lenses. We still have one seat open for our Road Trip and Rail adventure workshops. (The SF workshop has sold out.) If you'd like an invitation to either event, visit the TDS Workshops Page and use the Send Me Info form. This is The Digital Story Podcast #574, March 7, 2017. Today's theme is "Capturing RAW HDR with Your Smartphone." I'm Derrick Story. Adobe just announced a Lightroom Mobile update that includes an HDR feature that makes use of the Raw capture capability of the latest mobile devices. The app instructs your cameraphone to scan the scene to determine the exposure range, then it captures 3 DNG files that it uses to build the HDR image. We wanted to learn more about this, so we invited Adobe's Josh Haftel to the show to explain how this all works. And that's our lead story for today. After capture the files are automatically aligned, merged, de-ghosted, and tone-mapped. The end result is a 16-bit DNG that combines the benefits of the Raw file format and HDR, and can be processed in the same way as the HDR technology in Adobe Camera Raw and Lightroom. 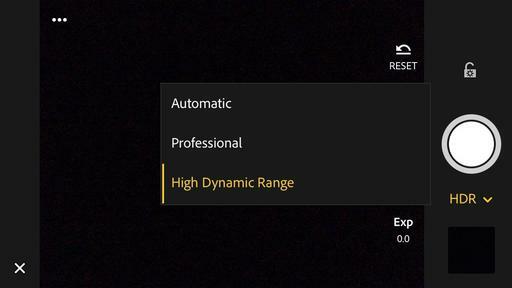 Compared to existing smartphone HDR modes, this method offers better dynamic range, according to Adobe. Members of Adobe's Creative Cloud service get the additional benefit of automatically syncing files and edits with their desktop. The algorithms of new HDR mode do require powerful hardware and are therefore limited to a relatively small number of devices, though. On iOS it works with all devices that are capable of capturing DNG files, such as iPhone 6s, 6s Plus, 7, 7 Plus, iPhone SE, or the iPad Pro 9.7. On Android at this point only the Samsung Galaxy S7, Galaxy S7 Edge and the Google Pixel models are supported. However, Adobe says it is working on getting the software to run on a wider range of devices. This description is from the DP Review article, Lightroom Mobile update brings Raw HDR capture mode. As you're listening to this podcast, I've already left Santa Rosa for a road trip to Southern California. Packed among my gear is a brand new MeFOTO Roadtrip Air that will be my three-legged companion for the next several days. I'll share my initial shooting experiences with it next week. If you want to learn more about the MeFOTO line of tripods, look for the colorful tile on all the pages of the thedigitalstory.com. And if you decide that you want one for yourself, use coupon code THEDIGITALSTORY to save 10 percent and receive free shipping. On Feb. 27, I shipped my Olympus OM-D E-M5 Mark II via USPS Priority Mail to Hackensack NJ for my first service using their PRO Advantage plan. The procedure goes like this. First you call Olympus at 1-800-260-1625, Option 4 to log in the repair order, get a service number, and the address to ship the camera to. Then you send off the camera with that information, plus your PRO Advantage service coupon in the box. Once they receive the camera, they acknowledge the possession via email. The service took one day, then I received it back on Monday, March 6. The camera was packed nicely, and everything looked great. The only gotcha was that my settings had been wiped out via the firmware update. So I had to spend a few minutes getting everything programmed back to my personal preferences. This service seems like a good option for the growing numbers of pro photographers using Olympus gear. We still have one seat open for our TDS SF and Road Trip workshops. If you'd like an invitation to either event, visit the TDS Workshops Page and use the Send Me Info form.